A point at home against Crawley continued an encouraging streak this season of (occasionally) winning points from losing positions. However, a tepid first half wherein the team struggled to adapt to a new system has done little to convince that we can absorb the blow of losing Jodi Jones for the season. This FA Cup game is another opportunity for Mark Robins to experiment with the line-up and formation to find the solution of how to cope without Jones. However, the sense of occasion of this FA Cup Second Round tie – for our opponents at least – makes this far from a pressure-free environment to try some things out. If we do find ourselves behind, it will be a team playing for their biggest ever result against one struggling for a sense of purpose and ideas in attack. As discussed last week, the creativity of Duckens Nazon and Ryan Haynes is especially important at the moment – underlined by how they combined for McNulty’s equaliser against Crawley. Ben Stevenson though was almost glossed over by myself, an encouraging second-half cameo shows how useful a ball-playing midfielder such as Stevenson can be for a team playing against a deep and organised opposition defence. A year ago we wouldn’t have accepted £1 million for him, now he’s in need of some big performances to get into a League Two side, individual footballing fortunes can change incredibly quickly. The biggest selection decision is likely to be whether Mark Robins sticks with a back three that didn’t really work in the first-half against Crawley, or reverts to a back four. While there are different ways to play back threes that don’t require ball-playing centre-backs, the Crawley game demonstrated how difficult it can be to play out with a back three against a side sitting off you. Given that this Boreham Wood game is likely to be more of the same, Mark Robins will surely ditch the back three experiment, for now at least. The make-up of our attack, particularly in the wide positions, will be intriguing. 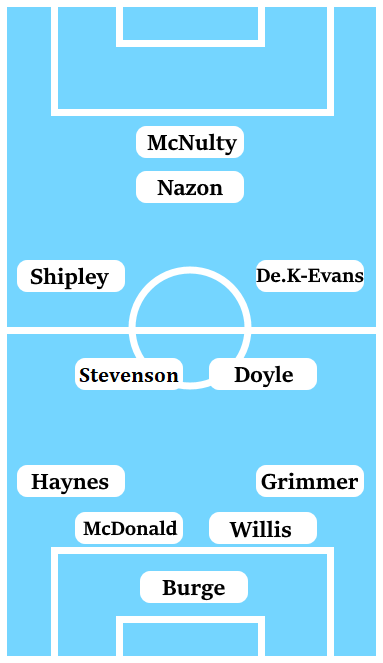 Mark Robins appears resistant to deploy Ryan Haynes as an out-and-out winger, while it also seems as if he’s aware that he can’t really shoe-horn in Duckens Nazon or Marc McNulty to a wide berth. That could hand Devon Kelly-Evans an opportunity to be our dynamic wide player in the set-up, particularly if Jordan Shipley or Peter Vincenti are played on the other flank. It may surprise you to know that we haven’t played Boreham Wood in a competitive fixture, and it seems we haven’t even come up against them in a friendly game. Weirdly though, we have played and won at their ground, in a friendly victory over Watford in the post-Callum Wilson phase of Steven Pressley’s reign. It was a showing that offered hope that we could make a 3-5-2 system work, hope that proved to be entirely false. After a few fairly underwhelming years in the National League, Boreham Wood have really come to the fore this season. The Hertfordshire side sit seventh in the table, are 11 games unbeaten, and came from behind to dump Blackpool out of the FA Cup in the earlier rounds. They are a team packed with quick players who had shown promise in their early careers with much bigger clubs, only to lose their way a little. Ex-QPR winger Bruno Andrade had led the way for the Wood this season with nine goals, while they have depth in wide positions in the form of ex-Sky Blues winger Blair Turgott and another former QPR youth-teamer Angelo Balanta. Given the career trajectories of some of their more talented players, it’s likely that several Boreham Wood players will be looking to prove a point in this game that they can make it in the Football League. The three aforementioned wingers have shown earlier in their careers during Football League loan spells that they can be match-winners on their day, and a big performance from anyone of those three could provide their careers an immediate shot in the arm. Someone else likely to be setting out to prove a point is ex-Sky Blues youth-teamer Shaun Jeffers – at one point rated higher than Callum Wilson in the academy pecking order. Jeffers has taken time to adapt to senior football, but earned a move to Boreham Wood over the summer after an impressive 21 goals in 42 appearances in the division below with Chelmsford City. He has however, struggled to get on the scoresheet consistently since his summer move. Additionally, their right-back, Kane Smith, was on trial with us last summer when Tony Mowbray was still manager, but was not offered a contract. With pace in attack, Boreham Wood have some experienced campaigners further back, with Dean Wells in central defence and defensive midfielder Tom Champion proven performers over several years at National League level. Given the balance of the side, it’s highly likely that Boreham Wood will look to sit deep before hitting us on the counter, which is likely to be a further indication that Mark Robins cannot play a back three of fairly slow (except Jordan Willis) centre-backs who aren’t the best on the ball. Our ongoing creative issues – inexorably exacerbated by Jodi Jones’ injury – makes it hard to be confident heading into what is, in theory at least, a relatively kind FA Cup draw. As mentioned earlier, if we concede the first goal in this game, we could find ourselves in a Ricoh Arena bear-pit fighting to avoid a cup elimination and the pressure starting to mount on our wider season. I can’t tell whether I think we can come through this test or whether I’m simply hoping we do. Regardless, I can see this being a dull and edgy 1-0 win, which is all that really matters in these kind of cup ties.